Paris, ca. 1908, Part de Fondateur au Porteur, #27573 28,5 x 31 cm, braun, rot, Knickfalte quer, KB, zwei Randeinrisse hinterklebt, extrem dekorativ, rote Sonne, R8. Paris, ca. 1908, Part de Fondateur au Porteur, #27573, 28.5 x 31 cm, brown, red, horizontal fold, 2 tears repaired, coupons, superb, red sun, R8. 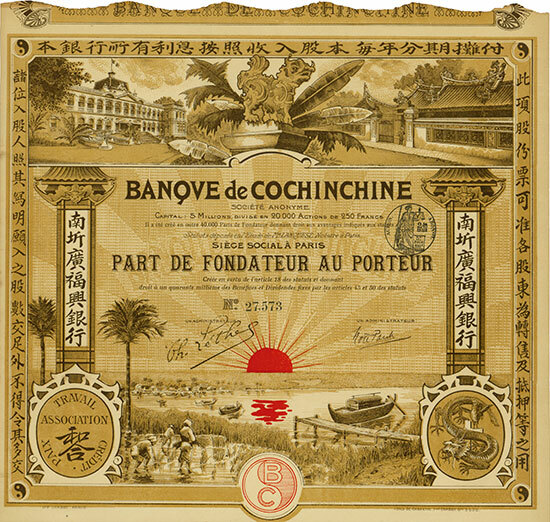 Cochinchine was a French colony which France bought at the end of the 19th century. It covered the area which was later South Vietnam. Saigon was the capital city.